To become a business visitor at one of the most popular ceramic tile exhibits in the world it costs 10 euro if you are Italian and is free for everyone else. It’s impossible to see all of Cersaie in a day or even two. We would even say that walking around the fair is an activity suitable only for the brave few, who are strong both spiritually and physically, who do not give in under the 10 kilo weight of catalog boxes. The exhibition occupies 22 pavilions, each of which contains over 50 representatives of various companies. This year we had 1078 companies. Half of them are tile producers, the rest of them offer bathtubs, showers, mixers, grout, glues, system display units for shops, and professional trade publications. 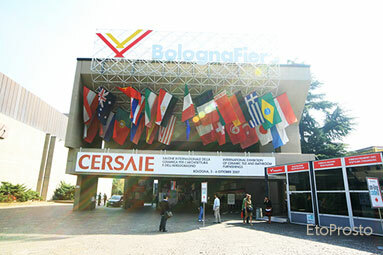 Cersaie takes place in Italy, therefore, in most of the booths (about 80%) you will find Italian products. The rest 20% or so, contain both Spanish and German products. However, a good number of foreign companies at the exhibit either have offices or warehouses in Italy, they have Italian addresses, and it is often difficult to determine the origin of the firm. Besides the exhibit itself you can attend special activities, such as topical seminars (“setting up a bathtub” or “who needs CE markings” series), award ceremonies in design, sponsored presentations of particular companies, interviews with architects and union representatives of tile producers. You can even attend a ballet production dedicated to the closure of the exhibit (you’d have to pay a little extra, since the theater is located in town). Is it worth going to Cersaie? If you have finally decided to renovate your apartment and spoil your neighbor’s mood, the best investment of your money would be a small robot that solemnly greets them at the door. Private clients are not particularly welcome at the fair. Honestly, the Italians are first going to act confused and then will not even give you a catalog. The best-case scenario would be if you are able to steal a brochure and find the address for a Russian distributor. If you want to get their attention, tell them that you are going to be ordering a truckload of tile. Better yet, an entire railroad car. Then you can get anything you want from them and, if you are so willing, eat dinner on their territory every night. Be ware of various dangers at the exhibit. First of all, the choices are so vast and tiles are so similar to each other that it is easy to lose your way and completely forget exactly what you liked. Therefore, if you like something – act on it immediately. Secondly, generally you will only see the latest collections at the fair, and it is hard to grasp the full spectrum of possibilities. In order to do so, you need to make your way to a good store, demand a general catalog of production companies and look through them for a couple of hours. The fair is going to help you understand how much tile is produced in the world and what is going to be in style in the next few years. Thirdly, there is a chance that the tile you so very much liked isn’t going to arrive into our country for a while. Most of the distributors have a well-formed warehouse program and are in no rush to bring in new products. Generously speaking, the tile is going to arrive to our country by MosBuild in April, when large-scale distributors have a chance to begin sales and show the product off to dealers. However, you will be able to order the product in Russia if you make a note of the company and the name of the specific collection. Things are looking up for you if you are an architect or a designer and have arrived to this fair just so you can later impress your clients with something great. Indeed, all of the most fashionable and unusual products are exhibited at Cersaie. You will gladly be given big thick catalogs that you can never get from Russian distributors. The weight of your load is going to increase from one booth to the next, so make sure to prepare an exit strategy – ask them to send you the catalog to your house (directly from the exhibit), or express mail it, since DHL is right around the corner. I have personally witnessed five designers sending home 8 boxes, 15 kilos each. The shipping price depends on both weight and arrival time, but usually, a medium parcel, which takes two weeks to get to our country, will be about 50-60 euro. It will take you anywhere from 40 minutes to an hour and a half to mail the parcel, since there is always a line and, generally, only one woman that is both processing the mail and giving out cash from credit cards. By the way, there are no chairs. You will also encounter dangers at the exhibit. Not all the tile that is exhibited at the fair will be mass-produced. Company representatives listen to clients’ feedback (that of large importers mostly) and those collections that did not get their interest remain only in memory and on photos. Therefore, do not rush to insert new products into your project designs, but first find out whether the collection is going to be produced and when might it make it to the warehouse. If you are Chinese or a representative of a Russian company and have arrived to this fair in order to gather new ideas, please be careful – you can’t take photos at most of the booths. You can be sneaky, until you hear a stern: “Signore, no foto” or “No photo, madam, please”. This is your cue to quietly leave the premises so you do not have to explain that you ran out of all of your business cards. If you are a journalist, it would be best to officially register on the Cersaie site. This way when you enter, a journalist kit is going to be waiting for you, and you will be able to receive invitations to special events that take place daily (interviews with important figures, seminars, design awards ceremonies, and breakfast presentations). There is a press center on the second floor of the central part of the exhibit complex. There you can find a conference hall with a snack bar and a schedule. This year the administration was happy to host 632 journalists at the fair, which is more than in prior years. If you are a distributor, this exhibit has been created for you (actually, it’s been created so the fair organizers can make money). Italy is the third largest tile producer in the world, right after China and Spain. You can find Chinese tile in China (such fairs as Ceramics China and Tilesan China), Spanish tile in Valencia at the Cevisama, but in order to see Italian tile you need to come to Cersaie. There are 225 companies registered in Italy that produce tile, and you can find all of them at this fair. Italians find Russia to be a promising market, and every company considers it to be its duty to have at least 3-4 main clients that import their product and distribute it all over the country. Therefore, those companies that do not currently have any Russian representatives are going to treat you as an honorary guest and shower you with world treasures. It is almost impossible to sign an exclusive contract, unless, of course you are able to guarantee a gigantic sales volume. If the company already has a number of distributors, they are going to be less interested in building connections in order not to break current business ties. All of the most well–known brands are already spoken for. Thus, the only way you will grab such companies’ attention is by placing a particularly large order. Majority of them are going to make you an offer and will ask you not to share this with anyone. Such is an accepted practice in the country of Machiavelli. Make sure to follow through on your order, otherwise, you will have the hardest time earning their trust back. All of the company agents and representatives are going to expect a large order from you, preferably, at least a container’s worth. Each company sells about three of such containers during the fair. Don’t forget to let them know which collections bring you to tears, and which do not touch you one bit – tile production is going to depend on this. You will receive catalogs and price lists, and most of the companies are even going to agree to send them to you via express mail to Russia. You are better off asking for a catalog of all potential displays right away. .
By the way, you are going to be particularly popular with the makers of such displays. They will be ready to battle for your single glance, and just in case, they will throw a good number of show-room and store designs your way. If you bring a blueprint of your location in AutoCAD, they will be yours forever. The only danger that is waiting for you is to overextend yourself with promises. Company directors are unforgiving. They will remember how you asked them to feed you at the booth and didn’t buy anything for least five years.